Flagstaff, Arizona: Northland Press, 1981. 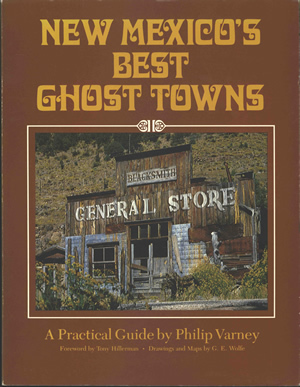 This is New Mexico's Best Ghost Towns by Philip Varney, for which Tony Hillerman wrote the Foreword. Drawings and maps are by G.E. Wolfe. It was published in 1981 by Northland Press in Flagstaff, Arizona. This is a paperback volume with a reddish-brown paper cover. The title of the book is printed in orange-brown at the top of the front cover. Beneath the title, a photograph taken by the author shows an abandoned general store at Mogollon, New Mexico. Below the photo is printed "A Practical Guide" along with the author's name, and credits for the foreword and drawings as above. The back cover is an advertisement for Arizona's Best Ghost Towns by the same author. A thumbnail of the book sits next to two photographs of abandoned buildings. Below that, text printed in orange-brown describes the Arizona book. At the bottom of the back cover is the publisher's imprint and the front cover photograph credit. Binding: Full-color paper covers. The spine displays the author's last name, the book title, and the publisher name in white on a taupe background.